Neurointervention in the Medical Specialties is a first-of-its-kind reference that serves as a bridge between the neurointerventionalist and the physicians who most frequently look to these specialists for answers to some of the most intractable problems they face. Providing background on the wide range of diseases treated through neurointervention along with the indications and alternatives to such treatments, this landmark title is grouped into four parts: an introduction to the tools and anatomical structures that are integral to the field; disease processes most often encountered by neurologists, cardiologists, and vascular surgeons; those diseases more frequently treated by neurosurgeons; and finally those diseases first seen by several other specialties including ophthalmologists and head and neck surgeons. 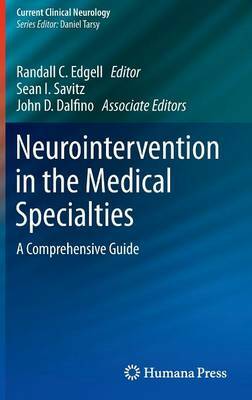 Importantly, each chapter includes details of neurointerventional technique and case discussions that are sufficiently detailed to provide a treatment template and guidance to neurointerventionalists in training and practice. At the same time, the descriptions provide referring physicians with insight into how neurointerventional procedures are performed. Finally, there are several concluding, thought-provoking chapters that examine what new opportunities await the field of neurointervention on the horizon. Neurointervention in the Medical Specialties is a major contribution to the literature and invaluable resource for all clinicians and researchers interested in this exciting field.